To help answer a few questions. The electronics ARE based on the 599, [Ten-Tec Eagle] not exactly the same, but VERY similar. Filters…. The 539 will have three filter slots for hardware receive filters. They will not be the same ones used in the 599, height limitation, but they will be designed in house and will match the characteristics / performance traits of the 599 closely. One will be filled with the default SSB filter, and the two others are for either CW or for AM if you so desire. Or two CW filters, up to you as a ham to see what you need and to fill them, or not. The filter slot module is based on the TX/RX board from the 599, it is not an option as some competitors are selling now. One less option to have to buy over the stock price. Then, of course, the same DSP bandwidth options controllable from 100Hz to the size of the largest hardware filter installed. The CPU is the same CPU we use in the 599, so we are using almost the same code set as the 599, meaning we aren’t re-inventing the wheel, just massaging it to handle the different buttons/encoders/pot/voltage levels/10w vs 100w/etc. This also means that the command protocol interface is already done, same as the Eagle, well, almost. We have added a few things to the 539 so that you can define certain buttons to do what you want them to do. On the four buttons, their function is selected by the “tumbler” as I call it. the “tumbler” is a three position switch on front of the 539, that by it’s position identifies what the four buttons do. It is currently denoted with “T” for top, “M” for mid, and “B” for bottom. This may change, as we get closer to production though. So, don’t bank on it being TMB. The DSP board is the same as we use in the 599, with “slightly” modified software due to the differences in gains and other “realities of hardware” differences. Since it is the same CPU and the same DSP board/code base, you will have almost all of the features / functions that the Eagle already has. And, since it is based on the Eagle, the maturity is already proven. And, as a benefit, as items are resolved in either the 599 or 539, it is a quick fix for the other rig. Reuse, something we are trying to stress highly on this and future rigs. Why re-invent wheels when they run so smoothly. Of course, improve them over time as technologies get better, as we have time, as we find new parts/better parts, etc. Why no 60 and 12? That’s basically it. We had a certain size in mind, and yes, we could have fit 160 through 6, however, you would have had receiver performance of a much inferior rig. One that we felt would not live up to TenTec standards. When queried, about 160, 60, and 12, MANY inputs went into the current state of the 539. 160 was added because of the amount of customer inputs, and unfortunately, 60 and 12 cannot be added due to size restrictions. Adding 60 and 12 would have meant redesigning the pre-selector with smaller parts that would have made the rig equal to most other QRP rigs in receiver performance. If that was the wrong decision, then the market will definitely tell us via sales, but from the comments on “when it is ready, I’m ordering a 539 and a 418” “I never use 60 in QRP” “etc.” at Dayton and via hundreds of emails and conversations, etc., we feel we do have a winner on our hand with the feature set it will be built with. The market will tell of course. There are a lot of rigs out there to choose from, and we do hope you give the 539 a chance to see if it meets your needs. 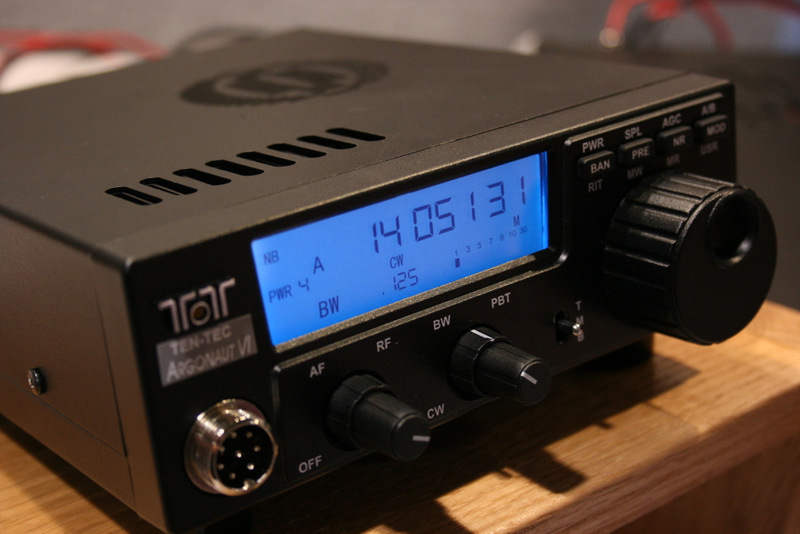 This entry was posted in Announcements, News, Product Announcements and tagged Dayton, Dayton Hamvention, Hamvention, Ten Tec Model 539 Argonaut VI, Ten-Tec Argonaut VI, Ten-Tec Model 539 Updates. Bookmark the permalink. I’m a big TenTec fan so I’m pleased to see them bring more new equipment to market. I can’t help but crunch a few numbers in my head though… if a fellow was intent on buying the 539 and the 418, the total price is going to be very, very close to that of the Eagle. And despite the 539 being small, when you place it and the amplifier side-by-side I think the Eagle will take up less desk space – and include 60, 12, and 6 meters plus an optional internal auto-tuner to boot. And then one would have an Eagle – not just a rig that’s “almost” as good as the Eagle. Unless one is only interested in the 539, I’m not certain buying the rig/amp combo is such a wise financial decision. Will the 539 have speech processing? This is essential in a modern QRP rig. Still puzzled about no 12m. Can the extra filters REALLY be such an issue? Personally I ‘d lose 160m, now a very noisy band in urban areas, for 12m any day. Another question: will the 359 be available in Europe from release date? Any delays in getting CE approvals ? Also any further news on pricing of the rig and any options? Good morning, it’s nice to see Ten-Tec introducing a new rig and not trying to re-invent the wheel while doing so. What is the weight of the new Argonaut VI ???? Hi again, is it heavier or lighter than Argonaut V and what would be the weight ? I believe it is lighter than the Argo V. I will try to confirm with Ten-Tec. Thanks very much Thomas… Quite light…… 1.7 Kilos…..